The Fire District has been billing for Emergency Medical Services since 2011. Billing is utilized to offset the costs of staff that were added in order to insure a timely response to our Community's emergency Medical needs. All persons who receive emergency medical assistance and transportation are subject to being billed. Residents of Fire District No. 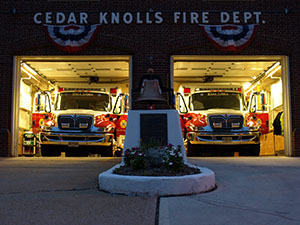 3, Cedar Knolls, are not subject to balance billing, because the taxes that you pay to the Fire District are considered as an offset. Balance billing is the process of attempting to collect any funds which insurance does not cover, for non-residents. Persons residing outside of Fire District No. 3, and who do not pay taxes to Fire District No. 3 are subject to balance billing. While you may reside in Hanover Township, the determining factor for balance billing is based solely on the Fire District in which you reside. For Non-Residents our billing agency will make a number of attempts to collect any outstanding balance. In some instances where no progress is made in recouping these amounts accounts will be turned over to a collection agency in order to try to recover any outstanding bills. If you reside within Fire District No. 3 you may receive requests from our billing agency in order to collect any insurance information, or perhaps to request payment of any co-pay that you might have for EMS transportation. If you have a particular situation that precludes you from paying your EMS Transportation Bill, or where a hardship exists that you would like the Fire District to review, please complete the District's EMS Billing Hardship form and return it to the Board at the address listed, or by Fax (973) 292-2576 or email.